PST management has become the major concern among the user this is because PST files contain crucial data and information which is stored in MS Outlook. A large number of PST files becomes an issue for the user as they create issues such as management problems, corruption of files and application performance. Therefore, in order to get rid of such issues the user needs to merge the files so that the data can be manageable and secure.To perform such a task user requires a software solution which is reliable and proficient for merging PST files. The PST merge software is one such reliable software solution which is secure, safe and capable to merge PST files. The software gives the amazing option to the user which merges multiple PST files swiftly. The software is user-friendly so that non-technical user can work efficiently. How can we merge PST files? In order to avoid corruption of files and management of PST mailbox and files items, the user requires methods that are capable of merging PST files. For the users, there are two methods by which the user can easily merge PST files into a single PST file. One is the manual method and another one is the third-party or PST merge software solutions. Though the manual method is a free method for merging PST file they have some disadvantages such as they are slow and time-consuming which can merge PST files into a single file. But the user has to keep in mind that the manual method may take enough time if the user has a large number of PST files. Therefore in order to merge PST files adequately, we advise using the third-party or the PST merge software. After the installation has been done run the program setup and open the Program. The users are also provided with option to remove, search or remove all the files the users need to. After the files has been add select Next. On selecting Next button the user are provided with the option to send PST files to target folder. The users are also given with options like Merge option (Join PST, Merge PST, Merge contact, etc) and PST option (Store name and file name). After all the details have been filled by the users click on Next button and wait for the process to get completed. After the program has been completed the user’s can Save the report and Finish the program. Select multiple PST files at a single time. Quickly merge two or more PST files without any restriction. The software do not consume much of the user time. Capable of merging ANSI and UNICODE both PST format. Support all the Outlook version and Window OS. Free mode to assure the product quality. 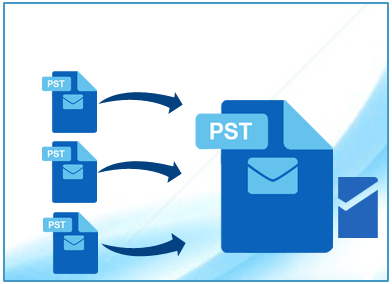 The PST files are the personal storage table which stores crucial information, emails, attachments, etc to avoid these PST files and mailboxes to get corrupt the user merge PST files in order to make it the success the user may require a software solution which is reliable. Therefore, we recommend the user to opt for PST merge software as they are adequate and provide the guaranteed results.